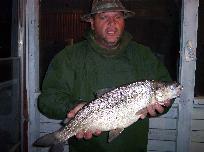 What our guests particularly like about the fishing at Poplar Ridge Lodge is the variety of fish on offer. 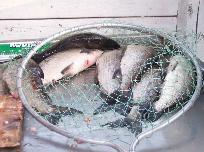 Walleye, Pike, Perch, Whitefish and Brook Trout are the five species found here. No matter the conditions, there are always fish to be caught. If it is too sunny and bright for walleye, you might find the Brook Trout still biting. 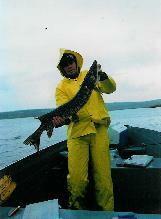 Northern Ontario is famous for its great fishing and Poplar Ridge Lodge is no exception. We play our part by not putting excessive pressure on fish stocks. We have a maximum of 16 guests per week staying with us during the summer, and with such a large area of water, fish quantities and sizes have remained large. 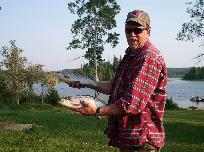 The nature of the lake and river system here also allows for more quality fishing time. Some of the best fishing is right behind the islands, not far from the dock. Due to the lake's size, it does not produce large waves and there is always a bay or river bend you can tuck into on windy days. Larkin Lake sports jumbo sized perch! We have some groups that come just to catch perch. Most anglers though, catch perch accidentally while fishing for walleye or pike. Perch tend to travel in schools, and are found in and around the weedbeds. Once our guests catch a perch, it�s often all they talk about. If you like fishing for pike, you can catch them until your arms hurt! 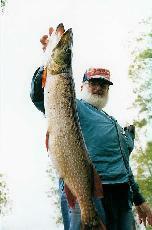 Pike are the ultimate eating machines and are a very aggressive sport fish. If you have kids, they are a good choice because they will bite on a rusty tin can but are still a bit of a challange to reel in. 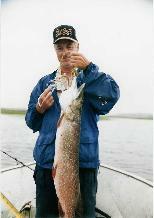 Pike are found all over the lake, and can even be caught from the main dock. 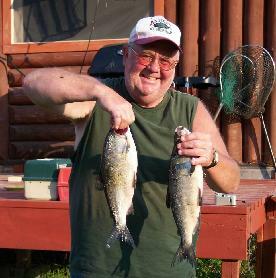 You may fish for natural brook trout in the many feeder streams, or take a short portage to one of the annually stocked brook trout lakes, where we have a boat for your use. 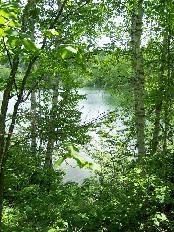 Spending an afternoon on the trout lake will become a memorable part of your fishing trip. In most instances you will find yourself alone on a beautiful spring-fed lake with your only company being a number of industrious beavers. Trout seem to prefer cool, clear, spring-fed waters, and have thrived in the 8 years since being established here. Small brook trout are numerours but put up a good fight. The larger fish are more timid and though you may see them on your fishfinder, they are not as abundant back at the fish-cleaning hut and therefore are a prized catch. Most people associate trout with fly-fishing, however we have seen much success from live bait, particularly night crawlers. 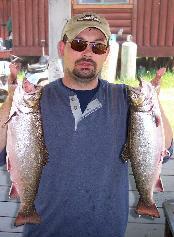 Whitefish are well known as a premium freshwater eating fish. They can be a challange to catch because of their tiny mouths and because they tend to live near the bottom of the lake. A nice part of catching whitefish is they tend to swim in large schools, so once you have the technique, you are likely to catch a great number.